It’s our family’s Easter tradition – we have it every year since we were little! 1. Preheat oven to 180*c / 160* fan. Grease and line your tin, I used a ring mould but a deep round 8 inch tin would work well. 2. Cream the margarine and sugar together until pale and fluffy. 3. Add your eggs one at a time, beating thoroughly in between each one. If it curdles, add a spoonful of your flour. 4. Add your vanilla, then fold in your flour until just combined. 4. Spoon half your mixture into the tin in blobs around the base of your tin. 5. Add a couple of tablespoons of cocoa to the rest of the vanilla mix along with a drop of water (about a tablespoon) and mix together until smooth. It should be a nice chocolatey colour. 6. Add this mixture in blobs in between your vanilla mixture in the tin. 7. Using a skewer or knife, swirl the two mixtures together to create a marbled effect. 8. Bake for 20-25 minutes (dependent on which tin you use, it is cooked when springy to touch and a skewer comes out clean when inserted into the centre. 9. Leave to cool, meanwhile make your glaze. 10. Melt the milk chocolate and cream in a heatproof bowl, either in a bowl over a pan of barely simmering water (ensure the bowl does not touch the water) or in short bursts in the microwave. 11. Once fully melted, leave to cool slightly so the mixture thickens up to a nice pouring consistency – it should be thick enough to coat the cake. 12. Place the cooled cake on a cooling rack with a tray underneath and pour over your glaze. 13. 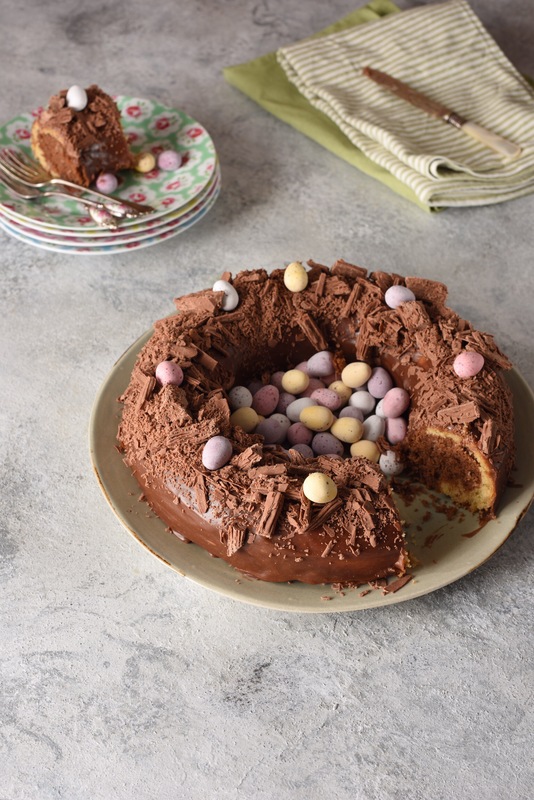 Once covered, chop up your flakes and top the cake to create a nest effect. 14. 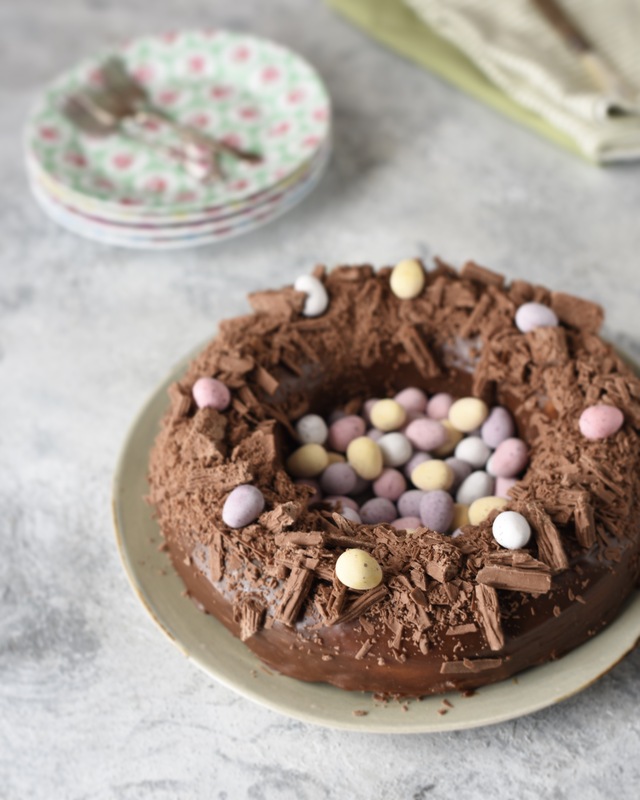 Top with mini eggs, and enjoy!